Levitation has a bit of a mixed track record, although I still think it's the best festival in town in terms of the quality of the music, which is of course the most important criterion anyway. Last year, I was so frustrated by the failure of the shuttle system that I wasn't sure I wanted to come back this year. (The rainstorms and mud didn't help, either.) However, they once again put together an incredible lineup and I decided to give it another go. In fact, I bought tickets for both Friday and Saturday. As I'm sure everyone has heard by now, the festival was canceled as of 5pm on Thursday. Heavy thunderstorms were looming once again, and the festival site was already worse for wear from storms throughout the last week. The organizers rushed to put together as many shows at local venues as they could manage, but unfortunately most of them sold out as soon as they went on sale, as the demand was understandably out of control. I failed to procure any tickets, but decided to try to see what I could see anyway. Details about the make-up shows were a bit scarce and initially available only through Facebook and Twitter. 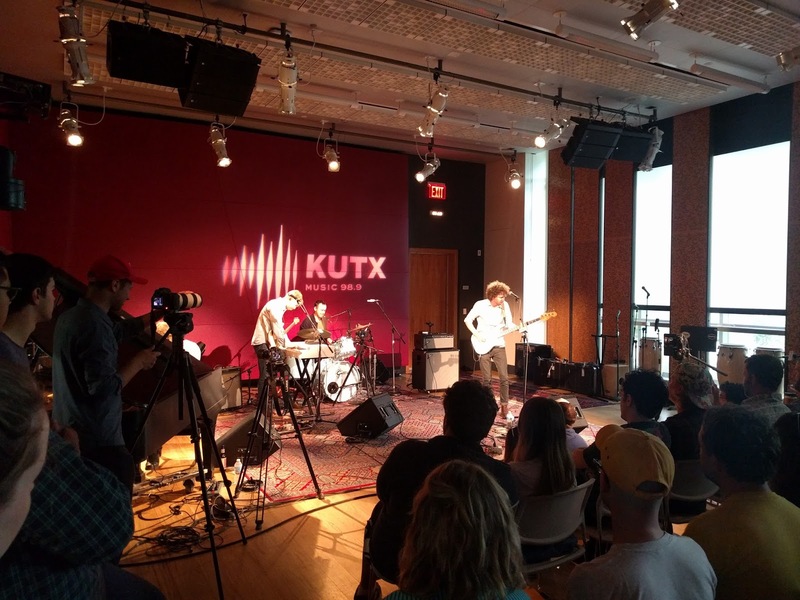 The Austin Chronicle began keeping track of them, and I saw that one of the bands I was interested in, Dungen, would be making an appearance at KUTX. I mentioned this to a friend, and he immediately was on board, so we rushed to the University of Texas campus, found a parking spot, and made it to the radio station studio just in time to be let in. All I knew about Dungen was that they were Swedish and occupied a space somewhere between psych, folk, and prog. The started playing something that sounded like standard-issue indie rock, but driven by a grand piano and a prominent bass. However, as the song progressed, it gradually turned into a serious prog rock jam. It slowly wound down, but without really pausing, the band started into the next song, which led into another tremendous jam. At the end of the third iteration of this pattern, someone whispered in the singer's ear and they brought the show to an end. They only played for fifteen or twenty minutes, but it was a fantastic journey. The instrumental work was top-notch, the harmonies were transcendent, and the jams were captivating without being excessive. It was just a shame they didn't get more time. It was before, during, and immediately after this set that the fiasco of the make-up show tickets occurred. Around 2:30, Levitation announced a series of make-up gigs, with a claim that ticket holders would have advance access. This took the form of an email sent at about 2:50 that contained the same links to Transmission Events ticketing pages that were available on the Levitation website. The tickets were supposed to go on sale at either 3 or 3:30 (reports varied), but it fact they appeared to go on sale at variable times throughout the hour. I tried my best, but I did not get tickets for anything. They all sold out with incredible speed. 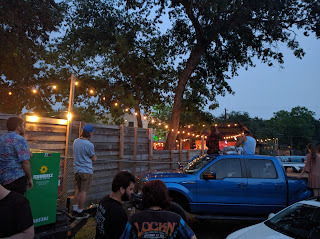 There was really only one that I was really, really interested in, though: Slowdive with Brian Jonestown Massacre and Twin Peaks at the Scoot Inn. In desperation, I scoured the internet for scalpers, but I could only find others looking for the same tickets. It wasn't a perfect experience, but I was excited for the show and figured it was worth making the most of it. Realistically, I couldn't see anything, and the audio wasn't as good as I'm sure it was inside, but I could still hear enough to enjoy it. (It also helped to have a friend join me and bring beer.) I'm going to do my best to review what I heard, although my scores will be admittedly somewhat tentative. I doubt my experience truly represents what the bands offered to the people inside. Twin Peaks played a sort of catchy but rather generic garage rock. They seemed to play rock 'n' roll fairly straight and by-the-numbers, but I appreciated that they did have some finesse about it. They were skilled at dropping in little rhythmic flourishes and shifts that kept their set from getting too boring. They didn't seem particularly sophisticated, but they sounded better than their studio work had led me to expect. The Brian Jonestown Massacre were up next. I actually saw them at Levitation two years ago, back when it was still Austin Psych Fest, and they were the topmost headliner after Primal Scream dropped out. That time around, they played good music, but they went on late, only played for 45 minutes, and were plagued by sound issues. This year there were no major sound problems, but they still only played for about an hour since they weren't the headliner. They again featured an abundance of guitarists that all mostly played the same thing, and while it did make for a fairly big, warm sound, it also was a somewhat monolithic or monotonous sound. They played consistently good grooves, but rarely played something really thrilling. The vocals had a characteristic sort of lazy, stoned quality to them, which contributed to a fairly mellow mood despite their classic rock obsessions. The side of their music more akin to shoegazing, as represented by their early album Methodrone (from which they played "She's Gone"), came to the fore. I suppose it was only appropriate considering the headliner, although I may have just been reading into it because of the pairing, and my removed location may have influenced my perception as well. An incomplete setlist can be found here. Ever since they reunited in 2014, Slowdive have relied on a fairly regular setlist for their shows. It's hard to complain, though, since it's a solid collection of songs. It is quite biased towards Souvlaki, and includes more EP tracks than anything from either other album, but that's probably a fair representation of their best work. Naturally, they started with the eponymous "Slowdive" from their debut self-titled EP. Slowdive also have a tendency to let their three guitarists meld their sound together into one big sound, but they make it work more successfully. While The Brian Jonestown Massacre aim for a thick chorus effect, Slowdive develop a gigantic wall of sound. They rely on a variety of guitar effects, driving bass, and airy vocals to build up their desired atmosphere. It makes for a beautiful and hazy sound that just washes over you in waves. While the music flowed past, the vocals were mostly indecipherable, although that's fairly par for the course with shoegazing acts. At any rate, the music was somewhat heavier and more intense than on record, which may reveal the insufficiencies of the production available to them at the time. At the point in "When the Sun Hits" where the song really picks up, it felt huge. It's already a great song on record, but this performance felt transcendent. Some other songs admittedly seemed a bit vague and meandering, but most of them were a wonderful experience to bask in. Despite my frustration and disappointment, I can't really say I'm upset, since it was clear that Levitation wasn't happy with the situation and was trying to make the most of it. I was far angrier after the shuttle situation of last year. However, while I sympathize with Levitation and trust that they are a committed, local organization dedicated more to the music than to the money, that's not to say they handled everything as well as they could have. 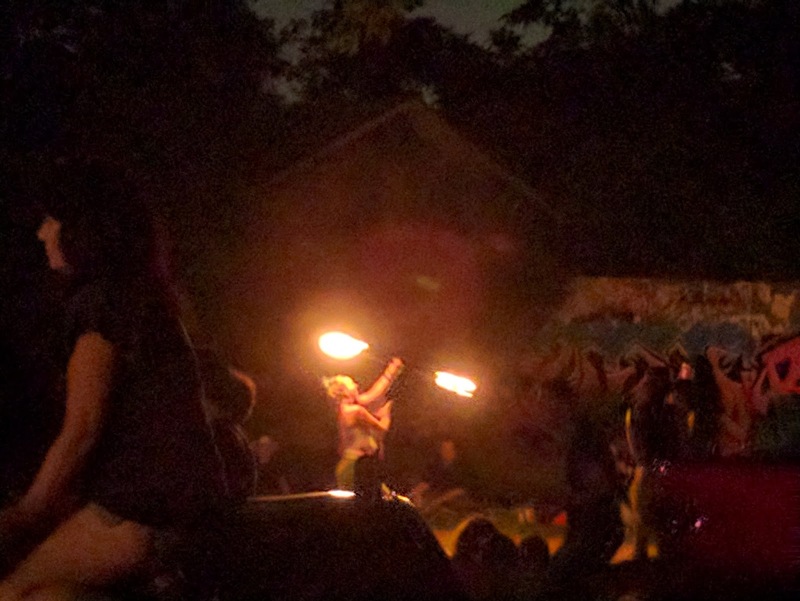 Levitation did a great job of putting together last minute shows all weekend, but disseminating the details was occasionally difficult. 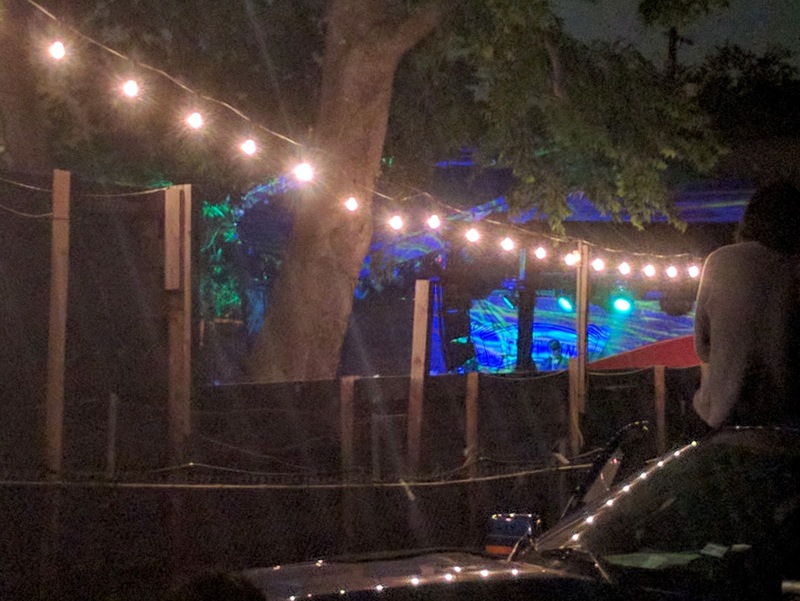 On the positive side, the shows were all $5 (or free) and all proceeds went to the Austin Relief Alliance. Much less positive was the fact that ticket holders were not actually given any sort of advance opportunity to purchase these tickets, despite the initial claim. This was particularly unfortunate for people that had traveled from out of town; all of their planning and early orders did nothing for them. In fact, the line of people that formed outside Scoot Inn for the Slowdive show got entirely screwed over. Supposedly, despite initial promises that they'd get the first chance at tickets, they were told at the last minute that they'd too have to use the overburdened website to try to buy tickets like everyone else. Since the tickets were cheap and could be bought in sets of up to four, there was a lot of complaining about scalpers, although I'm not actually sure how much of that really occurred. I've heard one report of a $75 resale, but not much else. P.S. Many thanks to Mustafa! P.P.S. What does it say about my luck (or the effect of climate change on Texas) that I have held tickets for the only Levitation to ever be canceled as well as the only day of Austin City Limits Fest to be canceled thus far? [Edit 2016.05.03:] P.P.P.S. Phone video footage of the entire Slowdive set can be found here, and an mp3 of the entire Dungen set can be downloaded from KUTX here. [Edit 2016.05.12:] P.P.P.P.S. The setlist of the Dungen radio appearance is here.